Vodohospodárska výstavba completes most of the necessary preparatory work for the left lock at the Gabčíkovo Waterworks prior to the start of the major Upgrade of the lock. VODOHOSPODÁRSKA VÝSTAVBA, ŠTÁTNY PODNIK (VV, š. p.) has completed the preparatory phase before construction kicks off on the “Upgrade of Gabčíkovo Locks” project. The greatest deficiencies in the left lock are set to be eliminated in the interests of increasing navigational security; the left lock is second in line under the upgrade schedule. 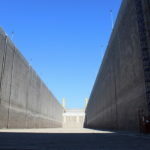 “We assessed the most serious defects in the left lock at Gabčíkovo to be remedied in order to ensure the security and flow of navigation through the waterworks during the modernisation project, which is set to take the right lock out of service for 18 months for upgrades. This means that only the left lock will be in service and we took the steps necessary to prepare for this period,” said VV, š. p., CEO Daniel Kvocera during an inspection of the work completed on the lock, into which today it was possible to enter with a dry foot. VV, š. p., plans to start filling the lock in October 2018. The inlet and outlet control valves were repaired during this preparatory work, along with the production of a large new temporary barrier for the upper and lower headings, the replacement of anchoring points for the upper and lower headings and the replacement of the side and lower supports, among other activities. 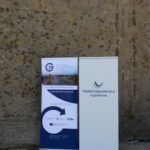 A key condition for starting construction work on the “Upgrade of Gabčíkovo Locks” project, which is co-financed with European Union funds, is the signature of a contract with the general contractor. VV, š. p., expects construction work to kick off in the spring of 2019. The “Upgrade of Gabčíkovo Locks” project is co-financed from the 2nd call of the Connecting Europe Facility (CEF). Total project costs are €144,665,000, with 85% covered by a European grant. The primary objective of the project is to increase the security, reliability and flow of navigation through the Gabčíkovo Waterworks along the Danube, which is a component of this internationally important TEN-T transport network. The main activities involved in the project include modernisation of the upper and lower gates, upgrade of the system for filling and draining the locks, bedrock stabilisation and the creation of an expert control system.